Last Wednesday was Women’s Equality Day, in commemoration of the passage of the 19th Amendment giving women the right to vote in 1920. 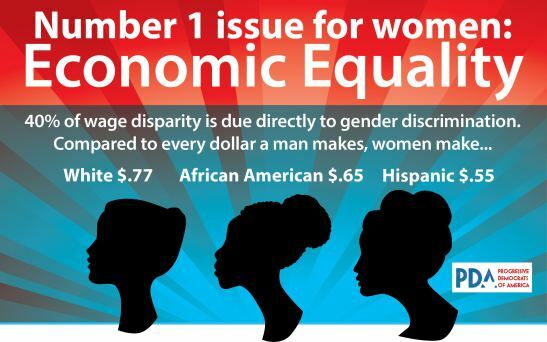 In commemoration, the Tucson Weekly’s Maria Ines Taracena published a blog post on The Range calling attention to Tucson’s dismal standing among US cities in terms of the gender wage gap. According a Census data analysis by SpareFoot.com, Tucson is at the bottom in terms of women’s median salary ($22,446, 2013 estimate), 5-year growth in median earnings (3%), 2013 median earnings as a percentage of men’s (73.9%) and more. An annual salary of $22,446 translates to $10.75/hour for full time work— far belong the $15/hour minimum wage promoted by the Service Employees International Union (SEIU). …like defunding or reducing access to low cost women’s health services, fighting against access to free or low cost contraception, shutting down abortion clinics, and cutting food stamps, child care subsidies, unemployment, public education, and community colleges. What else could the government possibly do to keep poor women living on the edge of society? Oh, I forgot… states are jailing women for miscarriages and shackling women to prison beds to give birth. And women of color are mysteriously dying in US jails. Are we barbarians? The focus of this article is wages. The dismally low median of $10.75/hour really struck a chord with me because of three recent articles I read: one in the New York Times about calculating whether your city’s economy could handle a minimum wage hike to $15/hour and the other two about a new Comcast call center coming to Tucson (AZ Central and AZ Star). Both news outlets are estimating that the new Comcast Call Center will pay roughly $31,000 (a figure that they derived by dividing the total payroll and benefits figure provided by Comcast– $35 million– by the projected number of employees.) The salary was estimated in the news because Comcast won’t release salary figures. The AZ Central article also had some other interesting facts about call centers in Pima County. Nationally, less than 1% of all jobs are call center jobs, but in Pima County, they make up 2.3%. In addition, AZCentral also reported an $8,000 disparity between what call center employees make in Pima ($24,000/year) vs Maricopa ($32,000/year) Counties. So… why am I obsessing about the local median wage and this new call center? Because the New York Times article (referenced above) reported that economists have determined that if $15/hour is ~50-55% of a city or state’s median wage, it is safe for that local government to raise the minimum wage to $15 and not cause job losses. (I’ll let that sink in.) If your city’s median wage is $30/hour, $15/hour is 50% of that. High wages cities like New York City (55%), San Francisco (47%), Boston (50%), and Seattle (54%) would have no problem raising the minimum wage to $15. But here in the Dusty Pueblo, $15/hour is 140% of our median wage of $10.75 because more than half of all Tucsonans are earning less that $15/hour. Pretty much, the whole town needs a raise. If the state or the city wants to cut deals with businesses to bring jobs here, please get at least $15/hour. Please aim higher than warehouses and call centers. Next articleTurns out all the Planned Parenthood “sting” videos were deceptively edited. Will some mainstream reporters who legitimized the story care? I want to clarify that the $10.75/hour median wage referenced in this article is for women living in Tucson proper. This is a 2013 figure quoted in a data analysis of US Census data. You’ll remember that the original quote above said Tucson was one of the worst cities in terms of pay inequity for women. Recently a story in the Arizona Daily Star quoted a median wage of roughly $15/hour for “greater Tucson”. This statistic comes from the Bureau of Labor Statistics, a different federal department. This figure includes men and people living outside the Tucson City limits– a few possible explanations for what appears to be a discrepancy at first glance. Here’s a link to insightful perspective on how poverty and slave wages serve the interests of those in positions of power and privilege..
Bottom line – gotta keep people poor so there is a steady supply of low-wage labor to puff up profits for the owners. The first paragraph of the article you cite tells you that it is not news, it is opinion, and an hysterical and extremist opinion, at that. The profanity in the second line tells you it is vitriolic in nature, and not particularly informative. I know of no one who is trying to keep poor people poor and I don’t know of anyone whose best interest is served by keeping them poor. Even those who benefit from low wages, such as fast food enterprises, are not served by keeping people poor because there always large number of entry level people seeking employment that don’t necessarily need a living wage. They don’t need a “career staff”. Seattle is an excellent example of what happens when a government determines the City can afford to mandate a $15 an hour minimum wage. It is far more complicated that a simple mandate and has negative effects on those for whom it is intended to help. Minimum wage employees are having to ask to work fewer hours because as they make more money, they begin government benefits at all levels of government(one of those unintended consequences of well intentioned government poverty programs). As they work fewer hours, they fall into different Department of Labor work rules which chages their rights under law for appeals. Additionally, many small businesses have either (1) reduced the number of people they hire, or, (2) are moving outside of Seattle. Those studies you spoke of may apply very nicely to northeastern cities, but they don’t apply quite so well elsewhere. I don’t understand why it is an obligation of business (or government, for that matter) to pay people based upon their personal life situations. Regarding single mothers– government in Arizona has a role in creating single mothers, by denying basic legal medical services and making it more difficult for women control their reproductive health by limiting access to abortion and contraception. So— since the Arizona Legislature wants to control who has a baby when– rather than allowing would-be mothers and fathers to make their own decisions– the government should step in to help women with unintended and/or unaffordable pregnancies and subsequent childrearing by providing food, housing, and educational security for families. Unfortunately, in Arizona and other red states, Republican lawmakers care more about protecting fetuses than in protecting women and children. It’s all about ideology– not about growing health future generations. As this article says, Arizona state and local governments are giving away tax dollars to attrack low-wage jobs to Arizona. (Hey, don’t do us any favors.) When taxpayers are asked to foot the bill on incentives, the taxpayers should get more than poverty wage jobs. The comment about the poor having to work fewer hours so they won’t lose government benefits is a canard created to perpetuate the lie that the poor are lazy and living large on welfare. What I have read about Seattle and San Francisco is that those local economies are booming under a higher minimum wage. Minimum wage set by government entities is not the most efficient way to determine the correct wage for an enterprise, however. That is done through bargaining in good faith between a company and it’s workers with organized representation; a union. Thirty years of labor suppression has decimated organized labor so legislation is needed to make it faster and easier for labor forces to access union representation. No, that is not at all what I am doing. I have brother who long ago got caught in the trap presented by government handouts. In order to keep his health care, he has to finagle direct cash payments from employers so that he doesn’t exceed the threshold set by the State. In order to make up for the loss of his health care, he would have to receive a 43% pay raise from his current legitimate employer just to break even with the cash loss he would incur. That is 43% just to get him back to where he was before the pay raise. The same sort of problems exists with Food Stamps and all the other Programs in which he participates. He feels trapped. Poor people are not lazy, nor are they stupid. But they DO get trapped in the well intentioned programs. But all that goes to the design of the programs, not to the programs themselves or to the wage rate. The argument you’re making regarding the minimum wage actually could be made by an employer to say he’s doing his employees a favor by not paying more than minimum wage. And it would mean employees would affirmatively prefer lower wage jobs over higher wage jobs. Yes, it does go to the design of the Programs, but that is the reality of what people on the Programs face. I don’t think that employees “prefer” lower wage jobs, but I do think that their situation in life push them towards those jobs because of the very real concern of losing their Government benefits. I believe that most of them want to move into self sufficiency and better wages but it entails risks that many are afraid to take. It would be good if there was more Union representation to allow for collective bargaining power. Unfortunately, Unions seem to be easily corrupted. They have huge amounts of money in pension plans and that usually proves too inviting for corrupt individuals to ignore. Additionally, Unions become as arrogant in their power as any company ever was. I believe the unsavory reputation of Unions has played a big part in their slow but steady demise. In any event, I fear that many of the poor feel trapped where they are and they see no way out. The Programs to help them are well intentioned, but ultimately destructive. I agree, we should underwrite better jobs. I am not sure what would happen to the importation of companies to Arizona if the State aimed for better paying jobs, but you are correct that they should at least try to bring in better paying jobs. Regarding single moms…you have ignored what happened to Black families as the Government provided ever increasing numbers of Program designed to aid inner city families. As time went on, the Father were marginalized and eventually forced out of the family unit. Today, the vast majority of Black families are headed by single women who are trapped in these Programs producing children that will also grow up to be trapped the “system”. That same failed process is now occurring in Hispanic and white families, and they are just as doomed to being trapped in the never ending cycle of failure. What you want is even more of the same. I realize your intentions are noble, but the unintended consequences of these Programs are horrible for families.